PART OF ME DOESN'T WANT TO KNOW... Remember? Now that part of me hates you! happy to have you back thundy (I just realised that there is no smiley to give actual love to my fellow thumbs and my heart was shattered by this revelation). Somehow that resulted in the brainfart "Command & Concur"
I laughed. Yeah, you are right, the heat. It's so weird that that exists. That's the internet for ya. There's something weirdly captivating about that picture. Ok I was wrong you were right about the DLC thread. Didn't think the new DLC would be here since updated posts are not shown differently. Man, that rock formation + foliage in the puffins photo looks like something out of a 2D platformer. Maybe it's because of the depth of field effect. that Muppet picture is one of the most epic things I've seen in a while. What's really funny is that I was recently thinking about writing an email to the show about how I just realized what was going on inside of big bird. When I was young Big Bird was real. But when I was flipping through the kiddie stations for my daughter just the other day, I saw big bird and I was immediately struck by how he had a bad case of scoliosis and a gimp arm. That quickly I saw how the guy must be standing inside of there and I thought to myself what a miserable job that must be. I had no idea about this discussion going on here about the very same thing until today. I never checked the new posts on this thread before, I just check the first post for updates, which, by the way, have those stopped? Is it because this has become the big bird thread? Is Idle Thumbs some sort of weird coincident magnet? Everyone keeps coming up with stories about stuff happening to them coinciding with Thumbs stuff. Or are we just prone to over-analysing and reporting every single insignificant little thing? Or am I imagining that this happens a lot more often than it actually does? Chris, just listened to your newest song. Now I'm depressed. I was expecting a well-crafted and funny song. Not so funny, but still excellent. Might I suggest sending it to Kotick just for the hell of it? Addendum: Chris (and his new song) got namechecked in a Kotaku article today. EDIT: And on reading through the rest of the article I see that it was written by Chris' coworker (boss? I don't know the hierarchy of Gamasutra) Leigh Alexander. Go team Gamasutra! Does Editor-at-Large give you some kind of awesome free ranging editing power, like a space ranger of game reviews? I'm sorry. I just wanted to type the words space ranger. For those of you who are interested in solving a mystery SLASH discussing furniture logistics, here is the photo of the "Gaming Position" chair thing mentioned at the end of the episode (that was my email the Thumbs read). Input is appreciated. I am no closer to figuring out how this thing works than the moment I first saw it. 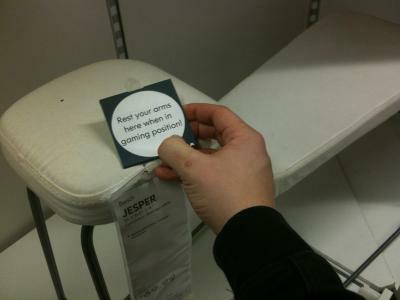 Looks like it's something you put next to your normal chair to rest your arm on while gaming. Like an arm rest. Except higher, for mouse usage. No, I think I've seen photos of this in use. It's made so you can slouch forward with your elbows resting on the raised part, I think. I guess it would have helped to see the whole thing. Agreed. There are all sorts of things wrong with the way that thing makes you sit. Ah. So it's basically a bicycle seat for your living room. Fantastic. It seems far more suited for more adult situations.